This is the one-year anniversary of the start of my trip to India. A year ago today, I boarded a very long non-stop flight from Chicago to New Delhi. After clearing customs I went to an airport bank to change some money. It took a while, but a driver who had been sent to pick me up waited to take me to a Holiday Inn, where I finally crashed. The next morning another driver took me to the airport for a flight to Jabalpur. My sister and brother-in-law where there to welcome me when I arrived, which was very nice. We then traveled to the holy Narmada River, to fulfill the prime purpose of my long journey. As it turned out, November 14, 2016 was a very significant day in three major religious traditions at this celebratory time of year. We hired a boatman, and after some special prayers, I spread Sali’s ashes on this peaceful celestial river as he rowed the boat towards and around a small temple at the foot of the Gwari Ghat. This took place during the late afternoon on a Monday, a moon day, but the largest full moon in 70 years, the supermoon! It was highly significant, worthy of Sali’s spiritual merit she had earned offering a lifetime of one-pointed devoted service to Maharishi Mahesh Yogi, founder of the Transcendental Movement. Some of his ashes had been spread at this holy place as well. See more details in last year’s post I wrote 3 weeks after returning home: An early attempt at some kind of closure with a poem on Sali’s passing and auspicious times. You can read the many inspiring tributes that were given at the October 5th memorial service, about her brilliant mind, kind heart, and good nature. It was evening by the time we arrived at the Bijouri Campus in the Brahmasthan of India. During my 3-week stay there I would meet many wonderful meditators and sidhas from different countries around the world who came for the Maharishi India Courses, to meditate and enjoy the recitations of the Maharishi Vedic Pandits. It was a very healing atmosphere to settle into. Just what I needed, thanks to my family. To start our course, we were each given a special welcome by the Maharishi Vedic Pandits and garlanded with flowers. Here is a photo of me, taken last year, November 16, 2016, after that warm reception. I purposefully stood in front of a large beautiful painting of Guru Dev, Maharishi’s master. I had purchased a print of this latest painting of Guru Dev the previous summer, having seen it featured at Art Fifty Two in Fairfield during a reception for the artist and her work. I had taken a photo of Frances Knight at the gallery standing in front of the original painting. You can also see part of a large Holy Tradition painting on the back wall behind her, one of many she had painted in the past. On one of our trips we were taken to the geographical center of India known as the Brahmasthan. We shared a short group meditation and took photographs. And once a week we were driven to the Maharishi Vedic Pandit campus to hear 1,500 pandits recite Atirudrabhishek, an ancient Vedic performance to create world peace. Sitting there with my eyes closed listening to the powerful Vedic recitation, I started to feel a deeply relaxing peacefulness growing inside my body. Soon, much to my surprise, I started to smile, then chuckle! I felt an inner happiness welling up within me that was totally unexpected. This bliss was a welcome contrast, a relief from the grief I was carrying around with me, mourning the loss of my sweetheart. This profound experience was worth the long tiring trip over there! We put on traditional Indian clothing for these special occasions and posed for a group photo before boarding the buses back to our campus. I am standing in the upper second-to-last row on the far left. The course participants came from England, Ireland, USA, Canada, several European and Asian countries, Israel, Australia, and many from Iran. We were a diverse and harmonious group. Now that I finally transferred all of my photos from my iPad onto my computer, I could post some of them related to this story. Who knows, maybe other photos will spark new stories. Grief persists after the loss of a close friend, but so does love. In time, grief recedes and love predominates. Here is a haiku for my sweetheart: Still Sali. I see that ‘still’ has both meanings: continuing and stillness. During difficult times, and Sali’s final days, we were helped by the kind staff from Hospice Compassus. After Sali passed, they continued to offer me support with their bereavement program throughout the year. On the one-year anniversary of her death they sent me a letter and a brochure, Journey Through Grief: Looking back at your first year. They encourage “Grief journaling and all forms of writing as an important and helpful tool for healing.” They offered helping prompts to those grieving to get started with these two Reflective Questions. 1. When thinking about the life of the person that you’ve lost to death, what — of themselves — have they given you to help you move through the rest of your life? 2. During your walk through grief, what have you learned about yourself that will assist you in moving forward? I had been writing in a journal all along, and posted some entries and many poems. After reading these questions I was moved to write a haiku, then extended it to this tanka. I will give more thought to these questions and write something later, but wanted to post this tonight to mark the one-year anniversary of Sali’s passing. This entry, 9 months after her passing, reviews our relationship and what it meant: For Us—a tanka honoring Sali and what we shared. I also updated the entry Celebrating the Glorious Life of Sally Monroe Peden, which contains newer descriptions about Sali by friends who spoke at her Memorial Service. There are many beautiful tributes there, and now, halfway down, you’ll see today’s date, October 1, 2017, with new entries from David and Rhoda Orme-Johnson, Kate Ross, and later Rannie Boes. This new post, added November 12, 2017, is relevant: 1st anniversary of my India trip to spread Sali’s ashes on the Narmada River, visit Bijouri campus and Maharishi Vedic Pandits at the Brahmasthan. Related poem posted September 22, 2013: Haiku of the Heart – for Sali. Added October 1, 2017, A tanka remembering Sali and her gift to me on the one-year anniversary of her passing. Here is a picture of Sally Peden showing Maharishi a photo that may have been taken during their trip To Jyotir Math with western scientists in the spring of 1975 to tell the Shankaracharya about the Dawn of the Age of Enlightenment. I think it was a picture of the 2,500-year-old banyan tree under which Adi Shankaracharya used to meditate. She had a blurry one of Jerry Jarvis sitting under the tree, but I never saw the framed photo. This photo was taken in late May, 2007 at Sali’s step-mother, Petch Peden‘s house in Columbia, MO. I never would have imagined sharing a loving relationship with such a pure, brilliant devotee who had worked closely with Maharishi for so many years. There was obviously a very deep level of recognition between our souls. How else could such a thing have happened? These words, “We’re buddies,” had come into my head when we were introducing ourselves at MUM (another story) around 10 years after we had first met in Washington, DC, summer of 1993, but had both forgotten. She had registered some of us at a large group meditation course. Years later, not long after she had to move into Parkview Care Center (January 19, 2010), I recalled that incident during one of my visits, and reminded her of it. I also shared the two thoughts that had entered my mind at the time, when she walked up to me to ask my name and check it on her list. I never forgot them—Too bad I just got married (again); Too bad she’s on Mother Divine. She paused, remembered it too, and smiled. What a surprise for both of us! A Jyotishi, Indian astrologer, who came to town with ancient palm leaves, told us of our past lives together. He said we shared a deep bond of friendship and spirituality, this was a karmic repayment, I was now going to fulfill the promises I had made to her in ancient Vedic times, and that she should be with me at all times—her life depended on it. Many adverse situations would spring up over time to test that bond, but I was there for her, right up to the end, and beyond. Adversity—she experiencing and me watching the challenging changes she would go through in her mind and body due to Dementia—drew us even closer together. I lovingly cared for her, and experienced joy when we were together, even as I continued to grieve and worry about her when we were apart. It also fulfilled a lifelong desire to experience what devotion, spiritual love, was about. It was transforming, to say the least! I joked that she was making me look good because her friends were calling me a saint, and we both laughed. Early on, when she was going through neurological imbalances that affected her mental stability, I remember saying, “It’s so intense, Sal, what you’re going through, but look at it this way, you must be burning off a lot of karma; you’re evolving quickly.” She looked up at me and quipped, “Hello? So are you!” And we both cracked up laughing. She was my little munchkin. Sali never lost her sense of humor. Years later, when she could no longer speak, she would still smile and giggle, bringing joy to some of the nurses and aides who looked after her. Her inner nature remained the same; it was always uplifting to be with her. It will be 9 months on July 1st, 2017 since my sweetheart passed. Sali was a fellow devotee on the spiritual path, my best friend and muse. I have written many poems for, about, and because of her. Most of them are on this blog. They trace a lot of what we went through together. As difficult as it was at times, I would not change any of it. Our friends would often say how lucky she was to have me in her life, but I always told them I was the lucky one. We both acknowledged the blessing we were given—loving each other at that transitional time in our lives. It’s summed up in this Haiku for Her, repeated here with the hoku from The Rare Gift of Love, now put together in a new tanka. Added November 12, 2017: 1st anniversary of my India trip to spread Sali’s ashes on the Narmada River, visit Bijouri campus and Maharishi Vedic Pandits at the Brahmasthan. Though my mother died 31 years ago, March 12 this year is also the 100th anniversary of her birth. Another coincidence? A good day to remember two very special women in my life. Update: March 13, 2017: I had a hunch I would add something the next day, as I did on the earlier post about Sali referenced above. See For Us—a tanka honoring Sali and what we shared. Last night the older of my two younger sisters emailed to say she was made a TM Teacher on March 12, 1972. All 3 of use were in Europe with Maharishi on our Teacher Training Course. But the strangest coincidence dawned on me this morning. Both Sali and my mother died in their 69th year!! Here are 4 entries—two leading up to Sali’s passing; a poem describing it, written 7 weeks later from India, 5 days after having spread her ashes in the holy Narmada River; and one poem composed a few days ago in remembrance of Sali, and the gift of love we shared together. You’ve been practicing for your next journey. With the dementia and a possible stroke that rendered you almost speechless, how can you communicate, except with inaudible sounds, and even those you no longer bother to form or utter. But you can still smile and giggle, communicating great joy like the angels, with pure feeling and silence, where words are no longer needed or used. You’ve been practicing for your upcoming journey. You’re way ahead of the game. The nurse called this afternoon to tell me you seemed to stop swallowing. You haven’t been able to eat or drink. The Hospice nurse who knows you started putting things into action to get you back on Hospice care. Will know by tomorrow morning after their evaluation and direction from your doctor. So it looks like this is it. No more rehearsals. You’re going for the final homerun sliding into heaven. I think we’re better prepared now, having read The Grace in Dying. We have a better understanding and appreciation for the end game, which, as it turns out, will not be the end. Five days after spreading Sali’s ashes from a boat on the Narmada River in India during a most auspicious day, I started to write about our final moments together back in Fairfield when she passed, around 7 weeks earlier, during the first night of the Nine Days of Mother Divine, Navratri. The answer to a question of what had happened came in one word during an evening meditation at the Brahmasthan. It became the title and last line of this poem. Contained within An early attempt at some kind of closure with a poem on Sali’s passing and auspicious times. Included are some of the inspiring tributes to Sali we shared during her Memorial Service and Vedic Cremation Ceremony on that very special send-off. Updated March 22, 2017: On March 12th, I wrote a new poem for Sali, Haiku for Her. Five years earlier, on the same day, I had written the two-tanka poem, Sali’s Shakti. On June 30, 2017, nine months after her passing, I posted this piece with photos: For Us—a tanka honoring Sali and what we shared. On August 31, 2017, I posted, ‘In Our Loving Eyes’ a poem by @kenchawkin remembering a special love with Sally Peden. On October 1, 2017, I posted A tanka remembering Sali and her gift to me on the one-year anniversary of her passing. A repost celebrating the glorious life of Sally M Peden, which includes descriptions of her peaceful and graceful transition, memorial service, and Vedic cremation ceremony. Many beautiful tributes were added that give a glimpse of how special she was. Included is a poem I wrote about Sali’s passing, and descriptions of the auspicious times of her death, and spreading of her ashes in India’s holy Narmada River. May she reside in the highest heaven. Most recently added, June 30, 2017, 9 months after Sali’s passing: For Us—a tanka honoring Sali and what we shared. And ‘In Our Loving Eyes’ a poem by @kenchawkin remembering a special love with Sally Peden added August 31, 2017. 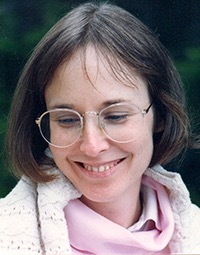 This photo of Sali was taken in the summer of 1992, about a year before we would meet. She arrived to register us for a large advanced meditation course in Washington, DC. When Sali came up to me to ask my name and check it on her list, two thoughts immediately entered my mind: Too bad I just got married (again); Too bad she’s on Mother Divine (a course for single women). Our lives would drastically change—my second marriage would end and I would eventually return to Canada, later leave to join Purusha (a course for single men) and travel the world; she would leave her way of life and end up at MUM in Fairfield, Iowa working for John Hagelin’s ISTPP and the NLP. We would meet there 10 years later in the fall of 2003, as if for the first time. A beautiful friendship would grow and transform our lives, a story worth writing one day. Sally M. Peden, passed peacefully and gracefully on Saturday, October 1, 2016, 11:17pm, during the evening of the first day of the Nine Days of Mother Divine, the start of a new moon. Her Memorial Service and Vedic Cremation Ceremony were held on Wednesday, October 5, 2016, at the Behner Funeral Home in Fairfield, Iowa, USA. Sali had devoted her life in personal service to Maharishi Mahesh Yogi since 1971. She traveled the world with him as a personal assistant and lived for many years at the International Capital for the Transcendental Meditation movement in Seelisberg, Switzerland working on many important projects. Sali was very humble, the sign of a great soul. She accomplished untold tasks for Maharishi, which pleased him, but never felt the need to draw attention to herself, just pure dynamic devoted service. Many emails from around the world poured in praising Sali. I’ll reference a few here. Sheila Chalmers had worked closely with Sali at International on several projects. In her tribute to Sali, which was read aloud, Sheila described Sali’s brilliant mind, amazingly focussed work ethic, and how much she learned from her. Emily Levin, a close friend of Sali’s, sent this wonderful tribute to Sali, which was also read aloud. Maharishi had paired them up early on, and Emily shines a glorious light on Sali and their fun-filled friendship. Some other people who used to work with Sali spoke at her Memorial Service. Alarik Arenander, a neuroscientist from the early days of Maharishi Eureopean Research University in Seelisberg, described an incident when they were recording an EEG of a meditating subject. Maharishi happened to enter the lab with an important guest. The scientists showed Maharishi the EEG brainwaves being printed out from the moving ink pens. Maharishi asked, “What is that?” Researchers again explained the brainwaves. After asking several times, since the researchers were not ‘getting it,’ Maharishi pulled apart the long ream of neatly folded EEG paper emphatically pointing to the long non-fluctuating line at the bottom below the EEG. The researchers had an ‘aha’ moment when they examined the breath rate signal, which indicated extended periods of no breathing. They had been looking to find a marker for transcending in meditation and there it was, right in front of them, unnoticed, until Maharishi pointed it out. Sali was meditating in the next room, and it was her clear orderly mind and refined nervous system that brought out the understanding of breath suspension during Transcendental Meditation as an indicator of transcendence! That, along with the orderliness of coherent brain functioning producing relaxed alpha waves. The rest is history! Gerry Geer, an MUM faculty member and ISTPP director of publications, described her extraordinary personality and some of the amazing things she had accomplished early on in her career. Gerry first met Sali around 1970 when he dropped into the Cambridge TM Center to find out what it was all about. She inspired him to learn TM and to become a teacher. Decades later they would work together at the ISTPP. Read Gerry Geer’s tribute to Sali. In it he mentions a very special incident he witnessed between her and Maharishi. It speaks volumes! Valerie Gangas, a friend and author, posted a personal reaction to that very special day celebrating Sali, and our relationship, on her blog: Life in Love with You. It was a powerful revelation for her! I am so thankful she wrote it. Also definitely worth reading! October 1, 2017: I am updating this section a year later on the anniversary of Sali’s passing. I had asked a few of Sali’s other friends who had spoken at her Memorial service to send me what they had said or remembered about Sali. David’s wife Rhoda, also a founding faculty member at MIU/MUM, recalled her trip with Sali and Rindi to Jyotir Math. They were in a taxi driving up the ever-winding road. To keep from becoming ill from the constant turns, they sang Broadway tunes. Rhoda was amazed that they knew the words and music to all the songs. David recalled that Rindi was on a path to becoming a musician and singer before she found Maharishi and the TM movement. She worked closely with Sali around Maharishi, and later became one of the leaders of the Mother Divine Program. Kate Ross sent me a description of what she had said about Sali last year. She was Kate Isen when they knew each other, starting in 1968. They shared a close friendship during those days in Cambridge, Mass, and Sali had rented a room in her house. Kate sent me a beautiful description about Sali’s accomplishments and humanity. When Sali returned from her TM Teacher Training Course (TTC) the change was even more dramatic. Kate didn’t think Sali could look even more beautiful, inside and out, but she did. It inspired her to go off to TTC. Later, when Kate joined International Staff in Seelisberg, Switzerland, there was Sali, “working as a dedicated close assistant to Maharishi. She was tremendously efficient and had powerful organizing skills, but in spite of being enormously busy with the greatest of responsibilities, she never lost the human touch to watch over people and do what was right. She was the brightest light, and an inspiration to all who knew her, and personally speaking, I feel so blessed to have been connected to her. We were and always will be spiritual sisters.” Read the rest of Kate’s inspiring speech about Sali. A few days later, Rannie Boes sent me what she had said at Sali’s Memorial service. She recalled how they first met in Denmark, Rannie’s homeland, in 1973. “She came to Copenhagen with Maharishi’s group when we had organized a big symposium on TM.” Decades later, they worked at MUM in the same departments. Rannie recounts a sweet story of what Sali had said about their relationship during one of her visits to see her at Parkview Care Center. Read At Sali’s Memorial by Rannie Boes. In the weeks leading up to Sali’s transition, I was reading two books to her. The first was an enlightened description of the nearing death experience, clearly delineated by Kathleen Dowling Singh in her reassuring book, The Grace in Dying: How We Are Transformed Spiritually as We Die. I believe this book prepared us for what was to come, to both let go and allow it to happen naturally. Sali would soon be put back on Hospice for added care, and moved to a private room, which gave us the needed privacy for such an intimate experience. She would pass within a few days, at an auspicious time in the Vedic calendar. The second book was The Ramayana: A New Retelling of Valmiki’s Ancient Epic–Complete and Comprehensive, written by Linda Egenes, a friend, and Kumuda Reddy. It is an inspiring story as relevant today as it has been throughout the ages, of dharma, duty, triumphing over evil; enlightened leadership; and an ideal love between an evolved man and woman. Listening to that story kept our attention focused on something spiritually elevating during her final days. I got as far as the end of Chapter 36, where Hanuman, after finding Sita, consoles and reassures her that Rama is preparing an army to free her from her abductor, Ravana, king of the rakshasas. This comes as a great relief to Sita who was at her lowest with no hope in sight. For the previous two days and nights, Sali’s breathing pattern consisted of short quick breaths, in and out. It was at this point in the story that her breathing began to change. It became softer, slower, and then, stopped. I waited for another, very feeble attempt, then put one hand over her heart and the other on her head. Not finding any sign of life in the body, these words came into my mind: “It’s done. The karma is over.” With a sense of relief and finality, I said: “Peace, Peace, Shanti, Shanti,” and lovingly kissed her forehead, our last goodbye. I felt a profound peacefulness deep within me, which I could not fully comprehend. The answer would come later, in a word, while meditating in India, where I wrote this poem. As promised, I did continue reading the rest of The Ramayana to Sali, wherever she might be, that evening and the following morning, finishing it at the funeral home, after they had picked up her body and brought it there. Her memorial and cremation would take place a few days later, still within the auspicious Nine Days. At the luncheon in Revelations following Sali’s cremation, one of our friends, Sheila Ross, suggested I take the cremains to the holy Narmada River, where some of Maharishi’s ashes had been placed. She said it was also close to the Brahmasthan, geographic center of India, where meditation courses were being held, and thousands of Maharishi Vedic Pandits were reciting Atirudrabhishek, an ancient Vedic performance to create world peace. At the invitation of my family, I did go to India, a little over a month after Sali’s cremation, to spread her ashes from a boat at that location near the Gwari Ghat. It turned out to be during a most auspicious time—a celebration of the holy day of Kartika Poornimah, November 14, 2016, also known as Devi Dipavali, the Festival of Lights of the Gods—one of the most spiritually significant days in the Vedic calendar, during the biggest full moon in 70 years, the supermoon! Truly befitting someone of Sali’s spiritual merit. Staying at the Brahmasthan afterwards for three weeks was healing for me. It was a powerful and blissful experience visiting the Maharishi Vedic Pandits in their large meditation hall, listening to them perform their Vedic recitations! You can sample some of them in these eCards, enhanced with audios, videos and slideshows. To get an example of Sali’s sweetness and our special relationship, see this previous post from December 8, 2016—Capturing an authentic moment in writing—about Being with Sali on August 1, 2012, during another full moon. I am so thankful for the support of our families, the Slusers, Kaplans, Mitchells, and Petch Peden and Robert Harper, and for many of our friends who helped handle so many details, especially Kate Ross and Jennifer Hamilton! I also appreciate acupuncturist Sarah Brooks, the staff at Parkview Care Center and Hospice Compassus for their tireless care of Sali, and sometimes me. Celebrating the Glorious Life of Sally M Peden; Final entries leading up to and after Sali’s passing; and this new poem, Haiku for Her. Added, June 30, 2017, 9 months after Sali’s passing: For Us—a tanka honoring Sali and what we shared. Added Sept 1, 2017: ‘In Our Loving Eyes’ a poem by @kenchawkin remembering a special love with Sally Peden. Added October 1, 2017, A tanka remembering Sali and her gift to me on the one-year anniversary of her passing. Added October 15, 2017, Still Sali Haiku—the persistence of love over grief. Added November 12, 2017: 1st anniversary of my India trip to spread Sali’s ashes on the Narmada River, visit Bijouri campus and Maharishi Vedic Pandits at the Brahmasthan. June 6, 2018: After rereading this, I realized how spiritually auspicious the dates were of Sali’s passing, on a new moon during the start of the Nine Days of Mother Divine, and the spreading of her ashes 45 days later in India on the holy Narmada River during a full moon, the biggest supermoon in 70 years, and on Devi Dipavali! According to numerology, these numbers are significant: 45, 4+5 = 9, completion, fulfillment; 70, 7 is made up of two lines, the individual I am, horizontal line, upheld by the Cosmic I Am, vertical line; and 0 is wholeness. Taken together, the whole thing seemed pretty cosmic to me! Went to see Sali Wednesday night, August 1, 2012, between 8:45 to 9:30 pm, full moon night. I was dropping off some supplies for her and came into her room to see if she might be awake. She was sort of sleeping in bed. I came up close to her and spoke quietly. She smiled, opened her eyes slightly and started to talk. I spoke to her some more. When it became clear to her that I was really there she became animated trying to say how much she loved me. I said the same to her. She was happy and giggled from time to time. It was a powerful sweet experience just being with her. It was joyful for both of us. I brought a chair over and sat next to her at the head of the bed. I leaned in through the open space where the bedrail ended and put my arms around her. My heart was at peace, happy; I felt whole again. That sweet memory of what it was like to be together made me see how empty my time alone on the computer back home was compared to sharing this joy. The peace and bliss I was feeling was palpable. She felt it too and we both laughed from time to time. Even with her physical and mental limitations, she was able to radiate this powerful spiritual reality from within herself. Life is a mystery, and a blessing, in ways that are unfathomable, in the most unexpected situations. I spontaneously spoke out the experience I was having with her and then quickly wrote these 3 lines down. Since I wasn’t actually lying next to her I later revised the last line to read: Being here with you. Then I completed the poem. Sally Peden would pass, October 1, 2016, four years and two months later. I’ll share that experience of our final moments together, which I wrote in a poem; and what happened with her ashes during another full moon, in a future post. An earlier poem, This Quiet Love, with links to others, will give you an understanding of our relationship, and what Sali meant to me; as well as this recent description of her Memorial and Vedic Cremation Ceremony, by friend and author, Valerie Gangas: Life in Love with You. Here is that update: An early attempt at some kind of closure with a poem on Sali’s passing and auspicious times. Nine months after her passing, I posted this remembrance with photos on June 30, 2017: For Us—a tanka honoring Sali and what we shared. On the first anniversary of her passing, October 1, 2017, I posted: A tanka remembering Sali and her gift to me on the one-year anniversary of her passing. Later on November 12, 2017 I posted: 1st anniversary of my India trip to spread Sali’s ashes on the Narmada River, visit Bijouri campus and Maharishi Vedic Pandits at the Brahmasthan.